Those of you who know me in person or have read my blog for any length of time have probably had a chance to hear me go on and on about how much I love, LOVE, The Mystery of History. I’ve had the pleasure of introducing several of my IRL friends and online homeschool friends to it, and helping them see the MOH light. I’m crazy about the fact that I can teach my kids with one group text, I love that it’s a 4 year cyclic series, I ADORE the biblical perspective, and I’m happy that everything I have to have is contained in the one, affordable, $50 text. So why in the world would I want or need to supplement a curriculum that I love so much? And how would I do that? 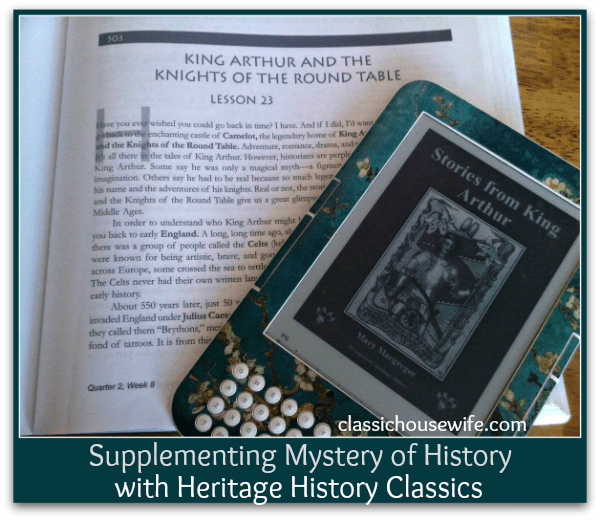 Why do I Supplement Mystery of History with Heritage History Classics? And that’s where Heritage History Classics comes in. It’s affordable, it doesn’t take up much space (just a cd for a collection! ), I can read them on my Kindle, I can find literature that corresponds with our time period, and it’s LIVING literature, too! How do I Supplement the Mystery of History with Heritage History Classics? Supplementing MOH with Heritage History is really quite easy. Mystery of History already comes with recommended activities by age level for each lesson. We’re doing Volume 2 of MOH right now and we simply add the Heritage History to our day, reading through stories that correspond with our time period. The Heritage History set we have is the Young Readers Classical Curriculum, which has a variety of tales from various points in history so we are able to find things for the time period we are studying now. 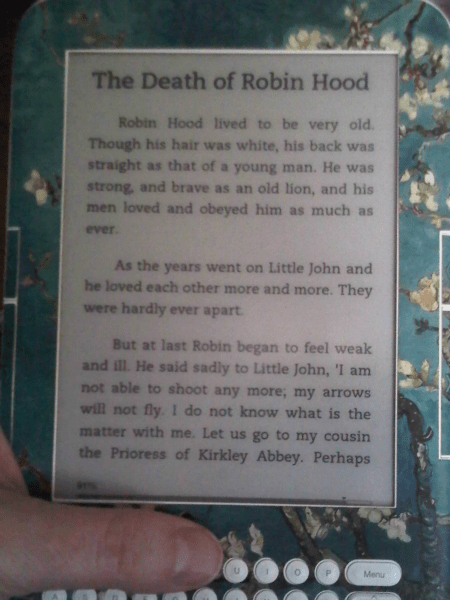 We began with Robin Hood, because I saw that we will later learn about him in our history book, and I thought it might be an interesting introduction to Heritage History for my skeptical children. The history lesson may only last a day, but through reading time we were able to spend more time enjoying the Tales of Robin Hood — and learning more about Medieval life. Really! When we reached a lesson about daily life in the Dark Ages, we were surprised to find how much history we recognized from the stories. Things such as how it was illegal to hunt the Kind’s Deer, and doctors at that time thought that blood-letting would cure illness were found in both the literature and the lesson. My history loving teacher-Momma’s heart was thrilled! “Reading time” isn’t necessarily a set time or day, but something we try to work in regularly. A rainy afternoon, extra time after lessons are completed, riding in the car, and bedtime can all serve as “Reading time.” It almost doesn’t even look like school, does it? At some point I could choose to incorporate notebooking for the stories we read, but notebooking is something we’re still learning and working into our day. So that’s how I’m using both the Mystery of History with Heritage History Classics together. We can still try to get other books from the library or buy some for our school library, but this makes it easy to ensure that we’re getting our historical living literature in our week! (If you have any questions, feel free to ask.) Next time I’ll share how I’m teaching the kids to notebook. I am a HUGE MOH fan as well and I am also supplementing our literature with Heritage History. We just started with Heritage History back in the fall and are loving it!